What is it? According to the American Academy of Dermatology, nearly 2% of the U.S. population will develop alopecia areata — an autoimmune disease — in their lifetimes. There are three types of alopecia areata. The common term “alopecia areata” is used when hair falls out of the scalp and leaves visible patches of baldness. “Alopecia areata totalis” is the term used for a total loss of hair on the scalp. “Alopecia areata universalis” refers to complete loss of hair on the scalp and body, including lashes, brows, beards, and, in some cases, even the thin, protective coat of hair over the whole body. 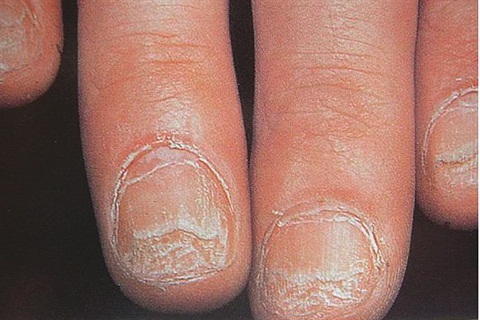 Very rarely alopecia areata will affect a client’s fingernails and toenails. When it does affect the nails — some or all — it usually creates a pitted look due to irregular keratinization in the nail matrix. Less common nail symptoms include longitudinal ridging, koilonychia (spoon-shaped nails), brittle nails, onycholysis, and redness of the skin around the nail. How do you get it? Autoimmune diseases like alopecia areata have long stumped medical professionals. There are no hard and fast answers as to why the body’s immune system turns on itself and begins harming the body it’s meant to protect. Doctors don’t know why the condition begins, nor do they know what triggers the hair to grow back. How is it treated? No cure for alopecia areata exists. However, in all forms of the disease, the hair follicles remain alive and are ready to resume normal hair production whenever they receive the appropriate signal. Hair re-growth may occur even without treatment, and even after many years. Medical treatment includes corticosteroids, which are used to treat milder cases. Products that contain minoxidil, such as Rogaine, are also used. For more severe cases, doctors may choose a treatment known as topical immunotherapy. What can a tech do? In those rare instances when a client has alopecia areata that damages the nails, don’t be alarmed. Alopecia areata is not contagious and the nails can easily be beautified. However, don’t immediately try to remedy the appearance of the nails with enhancements. Instead, consult with your client’s doctor. Alopecia areata is unpredictable, and the condition of the nail could change. Enhancements would make it difficult for the client and her doctor to monitor the changes. Also, remember a person suffering with alopecia areata has an autoimmune system that’s working overtime, so it’s very sensitive. Techs work with chemicals that are considered to be allergens. Any product that touches the skin could cause a negative allergic reaction. What else? Many people who suffer with alopecia areata benefit from consulting a therapist who can help them deal with the emotional and psychological trauma that accompanies hair loss. A therapist will be able to help them develop tools to deal with the overwhelming emotions that often accompany hair loss, such as grief, embarrassment, anger, loneliness, and depression. Wigs, scarves, and false eyelashes can help alopecia areata sufferers maintain a healthy, beautiful exterior, but often a professional is needed to help an alopecia areata sufferer come to terms with the internal conflict.